We’re so pleased to share some of the testimonials, reviews and feedback Schneider Custom Builders has received from customers and the community at large. First is our interactive map of projects and feedback shared through a third-party review site, GuildQuality, and below the map are direct testimonials we have received from homeowners. ~ Craig and Cindy R.
Read the full testimonial, here. ~ Jonathan & Rachel H.
~ Nan & Bob F.
“Schneider Custom Builders worked with us through an extensive pre-construction phase, during which they provided important advice and counsel on preparing our waterfront lot for construction. They understood the issues involved and knew which resources to use. During the construction phase, their advice was invaluable to help us build a house that would withstand the elements on the Eastern Shore of Virginia. They worked with a dedicated team of subcontractors who were experts in their field and cared about the work they were doing on our home. Most importantly, after our home was built and we moved in, they were very responsive to all issues, ranging from structural settling (we built on sand) to reacquainting us with the intricacies of the equipment we had selected. ~ Ervin and Elaine J. “When we started our project, we were very overwhelmed with the thought of starting a project of this magnitude, two hours away from the Beach. The only thing I knew about Schneider Custom Builders was that they built a lot of beautiful homes on the Eastern Shore. A complete renovation is a lot more complicated than a new home, there can be many more questions about how to handle the transition of new construction into the existing home. Looking back over the process, what I enjoyed the most about working with Schneider was the quality of the subs and Schneider staff. Having a project designer was invaluable for this project. The list of “to do’s” kept me on task and the project rolling smoothly. They have the undeniable talent to read my mind when it was important to make decisions quickly. If there was ever a problem that needed their methodical “eye for detail”, he could resolve almost any problem. 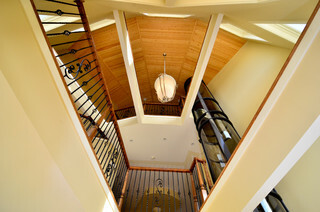 “ Schneider Custom Builders built our house on the Eastern Shore. My wife, Lilly and I have been pleased with their work. Over the past few years I have recommended Schneider Custom Builders to others. “As a landscape designer, I typically arrive on a construction project at the final hour. Regardless of the scale of the project, Jim and his crew are still well organized, on schedule and on top of their game.